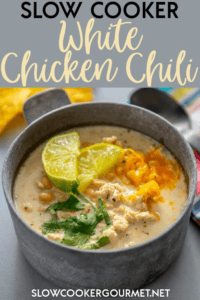 Chili in the slow cooker is always delicious, but there’s something extra special about Slow Cooker White Chicken Chili! It’s a good thing my family loves chili as much as I do, because I make it at least once a week all year long! But eating chili that often means we need to have a variety of recipes. You can see here that I have many chili recipes that range from the traditional to things like Cincinnati Chili to Buffalo Chicken Chili. 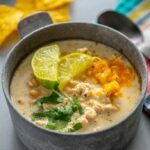 But what I couldn’t believe was that I didn’t have a Slow Cooker White Chicken Chili on my menu! I’ve made a few version before, but nothing we’d ever rave about. At least until now. 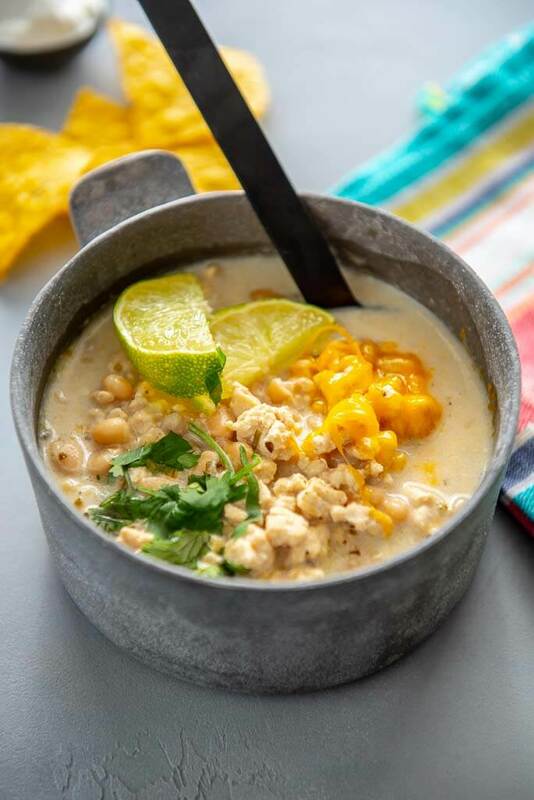 My family went nuts for this simple white chicken chili recipe, and I hope you will too! 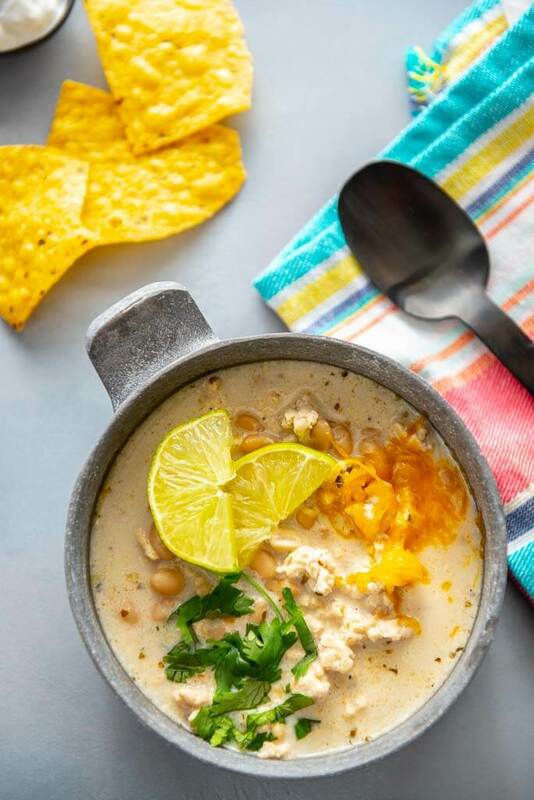 How do you make chicken chili in a slow cooker? For this particular recipe, I decided ground chicken was the way to go. But of course, that does mean one precooking step, but I think it’s totally worth it. The texture just works better with the richness of the broth in the chili. To make browning up the meat beforehand in any chili recipe easier, I always suggest using a multi-cooker! Having a multi-cooker has changed my life!! So many recipes are so much easier to make now without creating extra dishes to wash.
you can be as complicated or as simple as you like here! Navy beans are my favorite, and in my opinion the only choice here! They are small with a creamy texture and mild flavor. The addition of cream cheese adds richness plug a tangy zip! 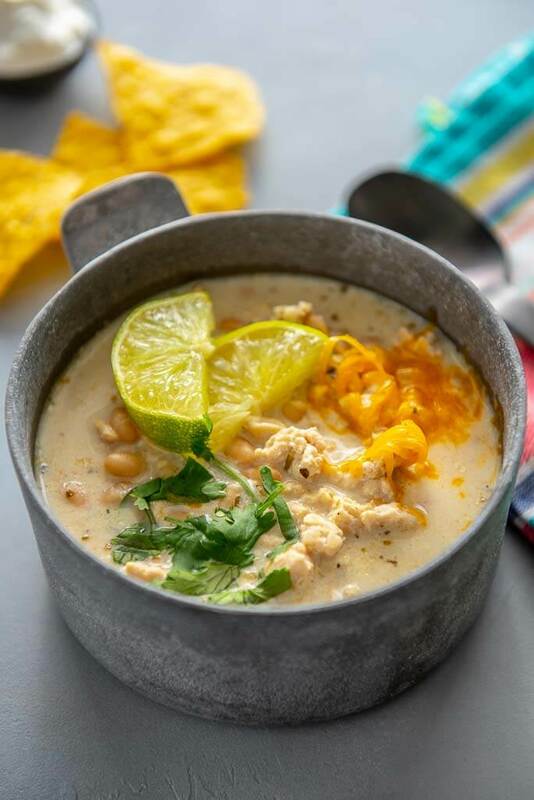 Chili in the slow cooker is always delicious, but there's something extra special about Slow Cooker White Chicken Chili! Use a whisk to stir well. This will require a fair amount of stirring to fully combine cream cheese. If it still seems separated, you are not done stirring. Serve topped with cheese, fresh cilantro, sour cream or as desired. Excellent and easy meal! Thank you so much! Thanks Ann!! I appreciate the feedback! How can I adapt this recipe to use chicken tenders or chicken breasts, to cook them (boneless, skinless) in the slow cooker and then shred the chicken and add them to the chili? I don’t like ground chicken. The recipe sounds good. I hope you can help me. Thanks! Had to tell you again–delicious and easy. Third time I’ve made this and husband and I love it! I added frozen corn the second time. Thanks again! If you make it on the stove then simmering for 30-45 minutes will be sufficient. In the slow cooker, because of the lower temps, it will take longer for the chili to simmer and the flavors to meld as they should.